We are a licensed Landscape Architecture firm, designing custom outdoor living environments in Northern California for over 40 years. Clients hire us for our unique art, construction, and architectural backgrounds along with our exclusive budget analysis feature. We are well aware that while design options are limitless, most budgets are not. Our firm specializes in designing personalized residential and public environments in the California San Francisco Bay Area. We are a full-service professional landscape architecture and design firm practiced in facilitating every step of your outdoor project; including conceptual design, budget planning, construction documents, contractor selection, construction site observation and more. It is our unique combination of professional background and transparent approach that allow us to create spaces tailored to our clients' vision and budgets. If you are looking to transform your outdoor space, we look forward to hearing from you! Envision Landscape Studio is a Landscape Architecture and Landscape Construction Firm. We see Landscape Architecture as an artistic expression of the synthesis of man, environment, and social interaction. We create outdoor spaces that are innovative, sustainable, and responsive to the surrounding environments. Being both Landscape Architects & Landscape Contractors allows us to view our projects from both an artistic perspective & constructibility perspective. 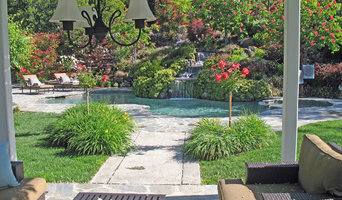 Alder Group, Pool and Landscape Co.
Bay Area Premier Landscape & Pool Design/Build Company Specializing in Outdoor Living We create & constructing unique swimming pools and landscapes. Best of Houzz Service Award Winner in 2013, 2014, 2015, 2016 & 2017!! For over 37 years, we have been creating and constructing unique landscapes. How exactly do we get you maximum results? We do it by giving you a uniquely tailored design, high quality workmanship followed by and meeting our timelines. After projects are complete we follow up with our warranty service calls. Alder Group Inspects grades and test drainage systems, test irrigation systems, test lighting system for proper electrical loads, and plant plants for the proper size holes and amendments, all our testing and inspecting are there to protect you and your investment and keep the callbacks to a minimum. As your project evolves and we see ways to improve your investment, we’ll speak up. Our objective is to design a unique garden that fits the personality of our clients and their home focusing on the details of blending and combined materials for the right affect. About the owner: Don Vivatson of Alder Group works with two of the best designers in the east bay area of San Francisco. Don will work with his client to help pick from the two designers that will best suit their project then will work side by side with the client and architect to get the best results. This is a winning combination. Huettl Landscape Architecture creates comfortable, yet compelling spaces that respond to the site, region and needs of the client. We design projects throughout the San Francisco Bay Area and beyond. Joseph Huettl is a licensed landscape architect specializing in residential and small to medium scale commercial and institutional projects. The collaborative design team at Susan Friedman Landscape Architecture (SFLA) firm creates custom landscape plans for residential, commercial, houses of worship and HOA's that blend with the architectural style of the structure and the unique personality of each property owner and homeowner. Every design is one of a kind and results in beautiful outdoor spaces that enlightens every sense. From start to finish, SFLA will guide you through the entire project from design concepts, to final design plans, to overseeing the installation process. Whether there is a need for a swimming pool, outdoor patio, shade structure, planting, lighting, and more, SFLA will help you through the entire process creating the perfect design to match your lifestyle and budget. Locally owned and operated, DPG Pavers and Design, founded by Dave Garcia, provides outdoor living solutions that are not only beautiful but also functional and compatible with the surrounding natural environment. With more than 25 years of experience working throughout the San Francisco Bay area, DPG Pavers and Design has a knowledgable staff of in-house designers who will create beautiful 3D conceptual designs as well as detailed plans that meet your style and budget. Here at DPG Pavers and Design, we take pride in implementing our designs to create your dream personalized outdoor living space. We look forward to working with you on your next outdoor project! Arborealis provides thoughtful, clever, engaging designs for residential and small commercial landscapes. With our 36 years of experience, L&L Landscaping has set the standard in creating drought tolerant landscapes that don't 'look' like drought tolerant landscapes! L&L Landscaping creates landscapes to improve the aesthetic, function, and drought tolerance all while transforming your outdoor living spaces. The L&L difference; We utilize our 36 years of extensive on site construction experience within the design and installation process to create a beautiful project that works in concert with the important functional components. We create landscaped entry ways that are functional and inviting with a sense of style. Our backyards are more than just a patio and plant material...it's your own private resort, an outdoor living area that is an extension of your home. Zacate Landscape Design is an award winning residential design company. Based out of the Dogpatch district of San Francisco, Zacate Landscape Design serves the entire Bay Area. Rooted in San Francisco Bay Area, servicing Northern California from the Bay to the Sierra. Laura Frost has been transforming homes and gardens into harmonious living environments for over 25 years. There is an advantage to hiring a designer with so much experience in both the inside and outside of your home. Laura understands the fundamentals of design; colors, textures and style, and has extensive knowledge about plants, stone, water features, drainage, irrigation, etc. Laura has used her abilities to manage/facilitate the building of projects, and has a working knowledge of the way things are put together, so she can accurately project timelines and estimate total costs, as well as connect you with contractors and suppliers. While Laura is not the only home or landscape designer in the area, her services are unique as they cover all design, in and out, and provide assistance for every step of the process, from concept to completion. She has developed a network of qualified contractors and has established relationships with suppliers, so that whatever you are trying to create, she will know where to go for the best services and products. Laura’s stunning designs receive rave reviews from clients, their friends and neighbors, and has been featured on HGTV. Miller Landscape Architecture is a Bay Area design firm specializing in residential design and project management. Susan Miller is a licensed landscape architect with over 25 years experience, 12 of those years as a licensed contractor. Susan's construction background provides tremendous practical experience to the design process, especially on challenging hillside properties. Her attention to detail and communication ensures a successful experience throughout the entire design and installation process. In addition, Susan teaches both Advanced Design (Grading and Drainage) and SketchUp Pro (3D computer modeling) at Merritt Community College. 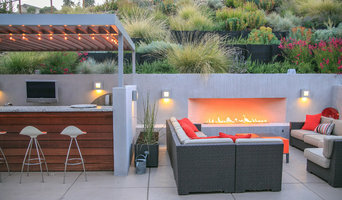 Bay Area's Top Landscape Architecture Firm - Best of Houzz! THN Landscape Architecture is dedicated to providing our clients with uniquely beautiful designs coupling ecological sensitivity with uncompromising functionality. We are passionate about creating landscapes and strive to minimize environmental impacts in every project we design. Ripley Design Group, Inc., founded in 1986 in Oakland, Ca. by Jim Ripley, provides comprehensive services from landscape architecture and master land planning through construction. Jim founded the firm with a commission to plan the Kaiser Hospital campus in Redwood City, Ca. Today we have experience with a spectrum of projects, including: parks, urban infill, multi-use, private residential, residential communities (both multi-family and single family), model homes, resorts, health care, commercial and institutional projects. As land planners and landscape architects our input is especially valuable in the marketing and merchandising of a project. Our involvement begins with developing the visual imagery of the project and translating these ideas into physical elements. Situated in Walnut Creek and the Napa Valley are the offices of Robert Mowat Associates. For over 30 years, our firm has provided thoughtful and creative solutions to design challenges throughout the country. The firm works on select projects of varying scale and type. Within a diversity of design work, we find a common goal: make each and every project succeed beyond the initial vision of the client and respective users to achieve an environmentally special and emotionally meaningful place. We deliver solutions that exceed our client’s expectations. A testament to our success is the number of repeat clients, awards and publications associated with our firm over many years. Robert Mowat Associates presents a studied and thoughtful approach to each project, focusing on environmental transformation. We embrace a collaborative design atmosphere giving each project an individual unique approach while respecting the program requirements of our clients. Our original and dramatic designs create exciting spaces that impact the way people live, work and enjoy their lives. 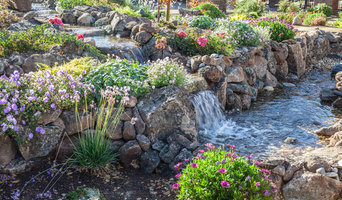 Christopher Lines has created one-of-a-kind garden designs working in the Bay Area and California creating architectural sensations for a variety of clients. He has been a Landscape Designer for 18 Years on the West Coast, with two studio locations: Walnut Creek and Carmel Valley, California. His designs are uniquely tailored to his clients and their personal tastes, taking budget and materials into consideration. This ensures a landscape environment which is truly customized to their desires, making dreams into reality. Christopher Lines has had the privilege of working on many interesting projects, diverse in size and style. One interesting and fun project was “Landscaper’s Challenge” on the HGTV network. He created a backyard Pool redux for a couple in the Hollywood Hills and went on to be the winning Designer. Christopher has also been a part of another great project working with tile designer Sergio Furnari on “The World’s Largest Pool” located in Dubai in the United Emirates. The pool is 600 yards long by 300 yards wide with a myriad of resort features: fire bowls, columns, diving pads, bridges, floating bars, water jets and fountains. He has written numerous articles in Watershapes Magazine, been published in The Robb Report, and featured in Walnut Creek Magazine, as well as additional mentions in Architectural Digest and Sunset Gardens Building Barbecues and Outdoor Kitchens. Give him a call or message today to learn how he can partner with you on your next project! SunBusters Patio Cover Company Inc.